2 Bdrm Grnd flr Flat. Hall. Lounge/Dining rm. Kitch. 2 Bdrms. Bathrm (CT band - E). Garden. Parking. Price over £199,000 Entry by arr. Viewing contact solicitors. (EPC band - E). Situated in the desirable west end of the city, within walking distance of an excellent range of amenities including independent shops, recreational facilities and public transport links across the city and beyond, we are delighted to offer for sale this spacious two bedroomed ground floor flat forming part of a popular development. Internally, the property is finished in fresh neutral tones, it comprises a welcoming entrance hall with excellent storage and leading through to the generous lounge with dining area which overlooks the front and the modern and fully integrated kitchen located just off. 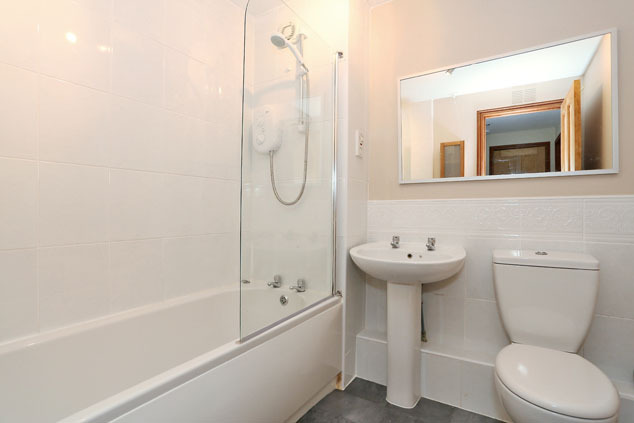 Finally, two double bedrooms each boasting built-in storage and a centrally set bathroom complete the flat. Outside, there is the luxury of a residents carpark with an allocated parking space and the mature grounds are very well maintained and provide privacy and shelter. This is undoubtedly an appealing property which will certainly be of interest to the discerning buyer therefore early viewing is genuinely recommended to appreciate all that it has to offer. 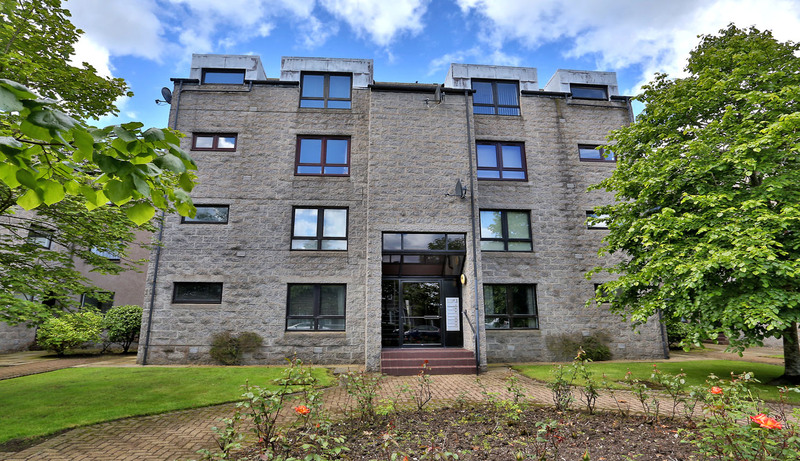 Cromwell Court is situated off Forbesfield Road located in Aberdeen’s West End. A quiet location situated within easy distance of the main Aberdeen ring road providing access to both north and south of the city. Mannofield is nearby with its excellent range of shopping and further amenities. There are good public transport facilities available both on Great Western Road and Cromwell Road. Communal Hall Protected by security entry system, the communal areas are neat and tidy with ample lighting. A door to the rear allows access to the carpark and a staircase rises to the upper floors. Entrance Hall A natural wood door leads into a small vestibule which continues into the entrance hall. Finished in fresh décor with laminate flooring and stylish panelled doors leading onto the accommodation, this hallway is most welcoming. Two deep cupboards provide excellent storage and between them house the water tanks, fuse box and electric meter. Lounge/Dining Room 19’7” x 17’11” [5.97m x 5.48m] approx. 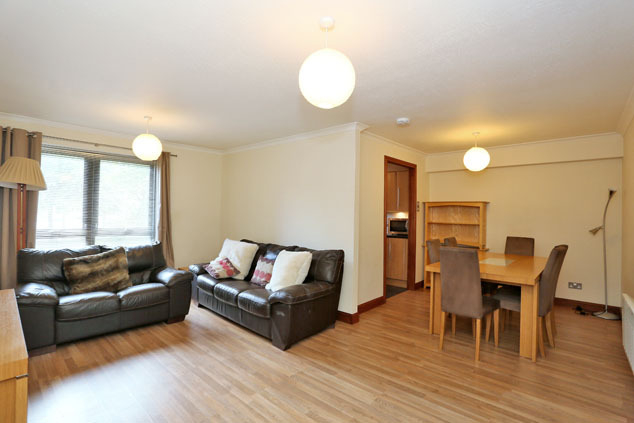 at widest This generous room is very well proportioned and overlooks the front of the development. A large window allows lots of natural light into the space and the room is further enhanced by fresh neutral tones and laminate flooring. A dining area sits adjacent to the kitchen and is perfect for everyday dining and entertaining. TV point. Telephone point. Smoke alarm. Kitchen 8’7” x 8’2” [2.62m x 2.49m] approx. Fitted with an excellent range of modern, light wood effect base and wall units, this stylish kitchen has extensive splashback tiling, under unit lighting and the units are topped with a roll top work surface incorporating a 1.5 stainless steel sink with mixer tap and drainer. The integrated appliances include an electric hob with stainless steel chimney extractor above, oven, fridge, freezer, dishwasher and washing machine. Completing the room is tiled flooring and neutral tones. Bedroom 1 11’9” x 10’6” [3.60m x 3.22m] approx. 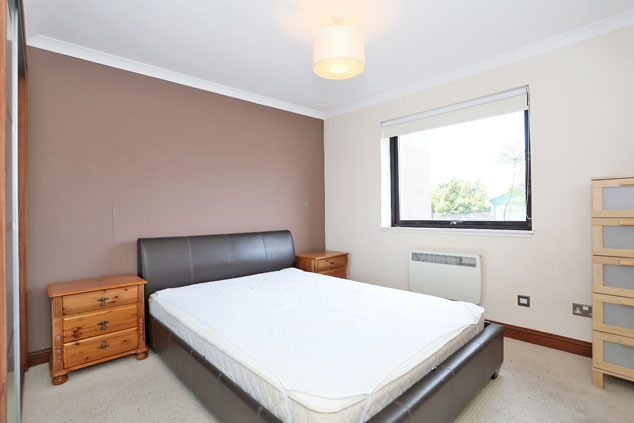 Enjoying a peaceful rear aspect is this spacious double bedroom which has excellent built-in storage provided by a double wardrobe with contemporary glass sliding doors and the good dimensions allow ample space for free standing furniture. The décor is in neutral tones with warm carpeting and feature wall. Bedroom 2 11’9” x 8’8” [3.60m x 2.65m] approx. 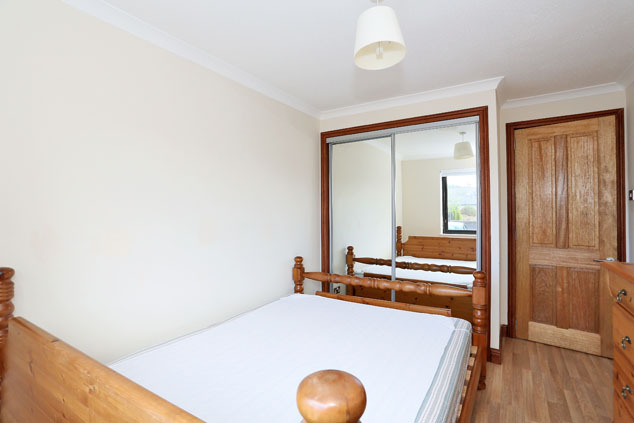 This second double room is also to the rear of the development and boasts simple décor and quality laminate flooring. A double wardrobe with mirrored sliding doors provides good storage and there is floor space for required furniture. Bathroom 6’11” x 6’6” [2.12m x 2.00m] approx. Centrally set, the bathroom has a white three piece suite which includes a w.c., pedestal wash hand basin and bath with electric Mira shower above and glass screen. Finishing touches include a wall mounted mirror, medicine cabinet and extensive splashback tiling around the sanitary wear. Extractor. Shaver point. Outside Forming part of a modern courtyard development, the well tended communal grounds are maintained by a factoring service. The gardens are mainly laid to lawn with decorative borders stocked with established shrubs and seasonal plants. An allocated parking space and additional visitors parking is located within the central courtyard to the rear of the property. Notes Electric panel heating. Double glazing. EPC=E. The subjects will be sold inclusive of all fitted floor coverings, light fittings, curtains and blinds along with all integrated appliances. 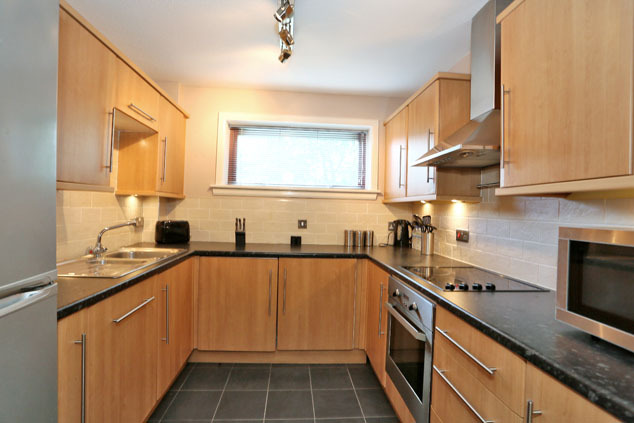 Buy to let opportunity, sold with tenant in situ or vacant possession subject to agreement on date of entry.